Each captioning request requires approval from either a Relay Site Admin or a Relay Caption Admin before the request will be sent to 3Play Media. Note that also Admins will also need to approve requests they have submitted themselves. Follow the steps below to approve or deny a closed captions request within Relay. 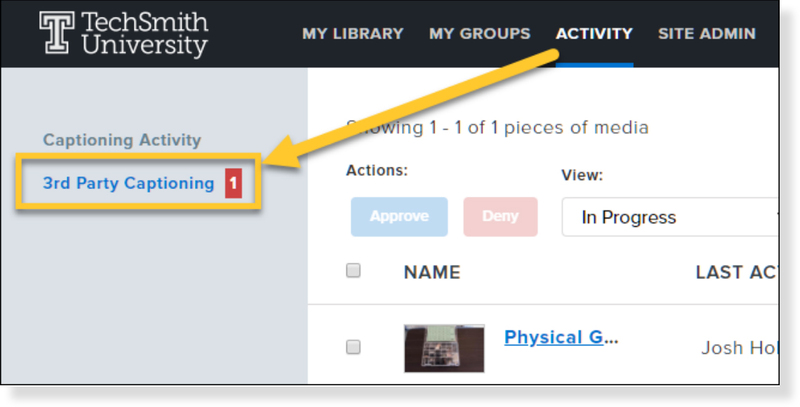 Click the Activity tab and then click 3rd Party Captioning located on the left-hand side of the page. Note that the number displaying next to 3rd Party Captioning reflects how many caption requests are awaiting approval. 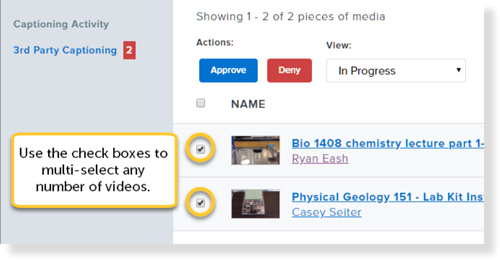 Admins can also multi-select video requests to approve or deny several requests at once. When an admin decides to Deny one or multiple requests they have the option to provide a reason. The requester will receive a denial notification email. Anyone who submits a 3rd party captioning request will be able to Cancel that request from the 3rd Party Captioning tab.